As the minutes wind down to quit’in time, you might start to think that the minute hand is actually moving backwards. Get the time off your mind for a few minutes and let your noodle process these new body kits! 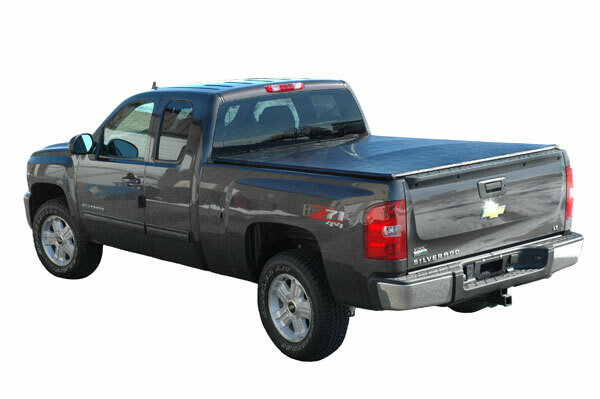 LAST MINUTE TONNEAU COVER DISCOUNT: Save $100 on the American Roll Tonneau Cover or American Work Tonneau Cover from Truck Covers USA. These are some top notch tonneaus that boast tough construction, rugged looks and hardened security. Save a hundred bucks off either of them by using the coupon code “TCUSA1“. Offer good through Monday, June 22nd. And if you haven’t gotten your pops something for fathers day yet, we also put together a Dads & Grads Gift Guide to help you make a quick decision. Check it out if you got a minute, have a great weekend! As fun as SEMA was, we didn’t get our fill of that new car smell, so one of the AutoAnything crew hit the LA Auto Show last week to pickup the scent once again. One truck in particular caught our eye; the ’09 Dodge Ram. Believe me when I say that this ain’t yo daddies 1500! The exterior has some significant yet subtle changes that improve the looks and add functionality. 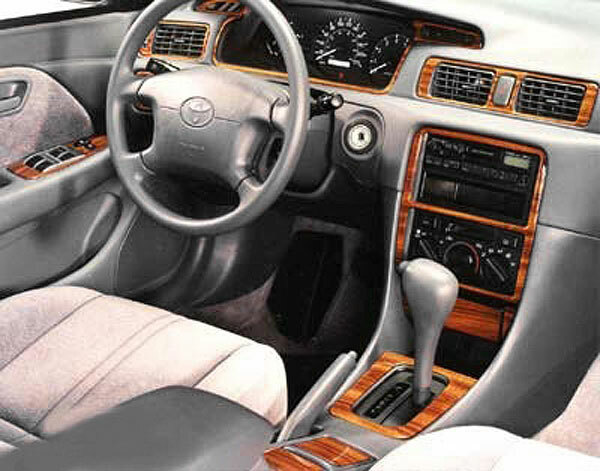 Optional two-tone paint adds a nice touch, as do the extra chome accents on the door handles and mirrors. Dodge has also revolutionized the truckbed with toolboxes that are integrated into the sides of the bed. 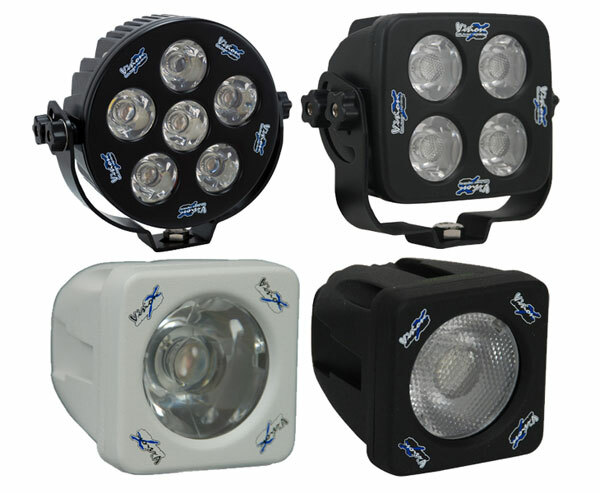 The RamBox Storage System is paint-matched, lockable, weatherproof, drainable and illuminated for the ultimate style, utility and convenience. The addition of chrome-tipped dual exhaust system integrated into the rear bumper finishes off the rear end nicely. Not only has Dodge redesigned the Ram on the outside, but it’s all new on the inside too. More interior options like heated and cooled front seats and a 7.1 surround sound system that will rock whatever you load up in the integrated multimedia and navigation system. 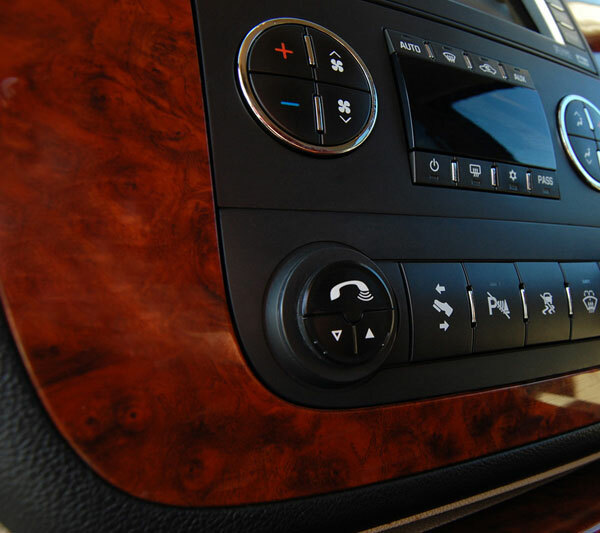 The nav system, dubbed uConnect, has a slew of new features including bluetooth, wifi, integrated Sirius Satellite radio and a 30 gigabyte hard drive. The all-new dash board looks both clean and functional; dual glove compartments give ample storage room while stitching accents the instrument panel. 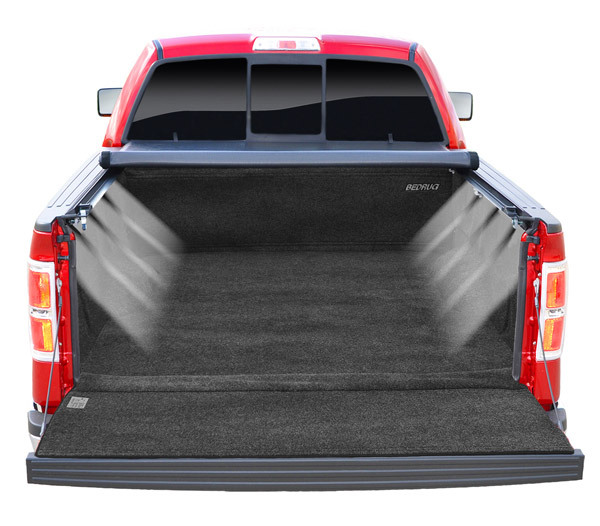 The Ram Crew cab is even more spacious in the rear with innovative “store in the floor” bins that have removable liners for easy cleaning. Dodge has stuck with the 5.7-liter hemi for the top-o-the-line power plant, but you can also get a 4.7-liter flex fuel V8 or a 3.7-liter V6. 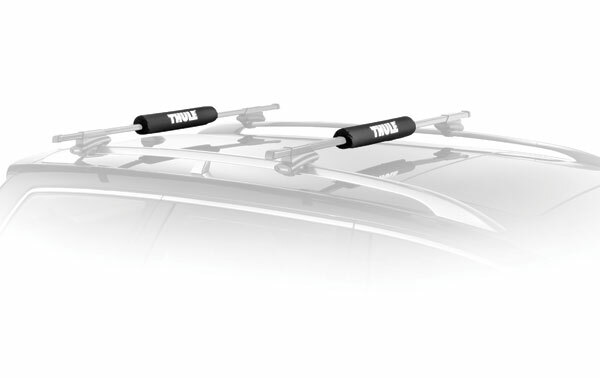 The rear suspension has been given new coil springs and a mulit-link design to maximize towing capacity without sacrificing ride quality. I’d suggest taking a look at the RamChallenge to find out how much more capable the horned beast has become… plus it’s pretty entertaining to watch. Think trucks and truck accessories are dead? The 2008 SEMA Show proved quite the opposite. Two new full-size trucks, the 2009 Dodge Ram and the 2009 Ford F-150, are driving hundreds of new parts to the aftermarket arena. Sure, accessories for green vehicles like the Smart Fortwo and Prius were given plenty of press ahead of the show. But there was little depth behind all of the high talk, as 2009 Ford F-150 accessories and 2009 Dodge Ram accessories outpaced parts for fuel misers by a cavernous margin. Clearly, SEMA’s sharpest parts producers still want and need to be in the truck business. The big economic and environmental guns at their collective temples demand that a few highly publicized bones be thrown in trendy directions. Still, virtually no manufacturer suggests that green car accessories can replace the green lost when truck sales are sagging. That’s probably why SEMA 2008 pushed a massive lot of 2009 F-150 accessories, but did so with little fanfare. Performance exhaust systems, suspension lift kits, lowering kits, style bits like billet grilles and body kits, and the usual utility suspects like tonneau covers and side steps all made their debut. The wave continued on the Mopar side. 2009 Dodge Ram accessories sharpened the horns of the latest 1500 from Auburn Hills. Lifts, slams, truck bed accessories and bold bull bars premiered at SEMA 2008, allaying some fears that this Ram is more Caravan than Power Wagon. Ford itself bolstered the 2009 F-150’s excitement with eye-attracting show concepts like the much-anticipated Raptor concept and a loaded jobsite dreamboat courtesy of DeWalt. While Chrysler’s Mopar booth focused on Challenger muscle, 2009 Dodge Rams roamed throughout the show floor as the showcase truck for dozens of brands. The hot story of SEMA 2008 may be about trying to make traditional accessories and performance parts for non-traditional vehicles. Behind this public face, though, truck accessories are alive and well – especially if you’re sizing up a great deal on a 2009 Ford F-150 or Dodge Ram. Expect no shortage of add-ons for the latest editions of these mainstay half-tons. 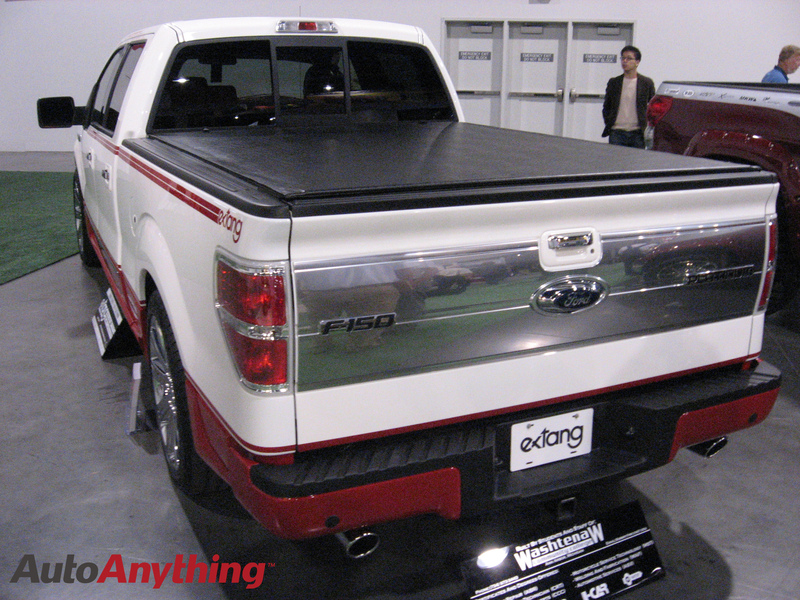 Image caption: Extang’s latest tonneau cover on a showy 2009 F-150 Platinum Edition. There was a time in my life when the sound of birds singing and of children playing on freshly mowed lawns brought a smile to my face. Now, after Wal Mart came and ruined my life, I feel nothing but hatred for the world, except, that is, for my Pace Edwards Jack Rabbit Retractable Tonneau Cover. Things used to be different. Back when I was in my early thirties, I collected a windfall inheritance from my parents. Rather than blowing that load right away on a Ferrari or a brick of cocaine as my scuzzy neighbor suggested, I invested it in my own company. I opened a small hardware store down in the heart of town. Those were some of the happiest days of my life. I’d wake up to a fresh pot of Folgers, head over to my shop, count nails and arrange the plungers in a fashionable way, eat a sensible lunch, and head home at 6:00 to nuke a Swanson’s and watch the Jeopardy. Yeah, those were the good times. Everyone in town knew my name, and they’d stop in every other day or so to chit-chat and maybe replenish their supply of gopher poison. I felt like I was living in a wholesome Norman Rockwell painting. But fate had some twists and turns for me, and I would have to learn the hard way that heaven doesn’t exist on earth. About three years ago, the abandoned warehouse on the outskirts of town was demolished. Up from the ashes of its carcass sprung my nemesis: Wal Mart. Suddenly, no one in town wanted to come into my shop and buy my wares. Apparently, the promise of a quart of paint that costs forty-seven cents less than mine proved too powerful a ploy for the townsfolk. No one seemed to care that the paint they were buying was made from the ground-up bones of child laborers who died from the noxious fumes at the overseas paint factory. I tried engaging in a price war, but they pummeled me on all fronts. In seven months, I was out of business. Dejected, I consoled myself with hard alcohol and pastries. In no time flat, I had packed on an extra 150 pounds. I hit rock bottom when my wife left me for the Wal Mart warehouse manager. Et tu, Madeline? Rather than wallowing in self-pity, I realized that I wouldn’t be happy until I had revenge. I needed to jam my fist into the belly of the Wal Beast, rip out its black heart, and bite off a still-beating hunk of the muscle while it stares, gasps and collapses at my American-made shoes. For that kind of mission, though, I knew it would have to be an inside job. So I turned in an application, interviewed with a pimple-faced punk of an assistant manager, and got a job as a cashier. Don’t get me wrong—it’s hard work. I’m only able to take two toilet brakes per shift, and I’ve found myself standing in a puddle of my own asparagus juice many a time, which has only heightened my hatred for the company. I’m making steady progress in my preparations. I’ve been mapping the air ducts and testing the response time of the security guard who rolls around the parking lot in his dusty Caprice. I even installed a Pace Edwards JackRabbit Retractable Tonneau Cover onto my Ranger’s bed. That way, when the time to strike arrives, I’ll be able to sneak my arsenal to work without anyone catching a glimpse and ratting me out. Plus, I get better fuel mileage, and that’s good for the environment. But not as good as whipping out the Wal Blight that is popping up all over these United States like canker sores on a rock star’s lips. Not that I will go through with any of these plans but it is good to vent, at least that’s what my therapist told me. And you know what, he’s right. Now I have three things in my life that are good: my Pace Edwards Jack Rabbit with its cool retractable tonneau cover and my therapist, Bill. Which Is A Better Buy, Roll Up Truck Bed Covers Or Folding Truck Bed Covers? I am a guy who practically lives out of his truck, so for me a good truck bed cover is essential. 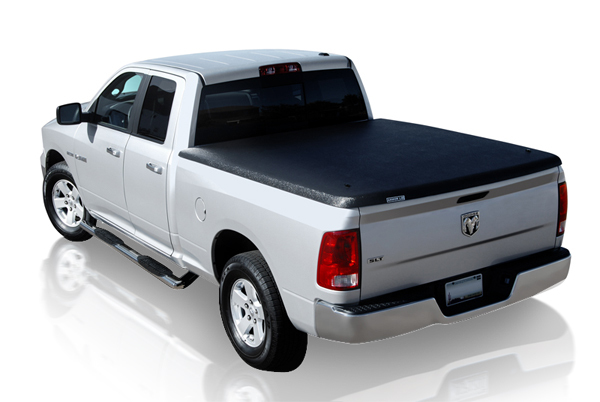 Recently, I purchased a new Dodge Ram hemi truck and needed to make a decision about a new tonneau cover. Would I get the soft roll up tonneau or the folding truck bed cover? Tonneau covers seem to be all the rage these days, especially out here in Southern California. A lot of guys buy them because they make their trucks look better not because they really need them. Of course, I like the way they make my truck look too but mainly I like tonneau covers because they keep people from stealing my stuff while protecting my possessions from the elements. I like the lightweight roll-up tonneau covers. 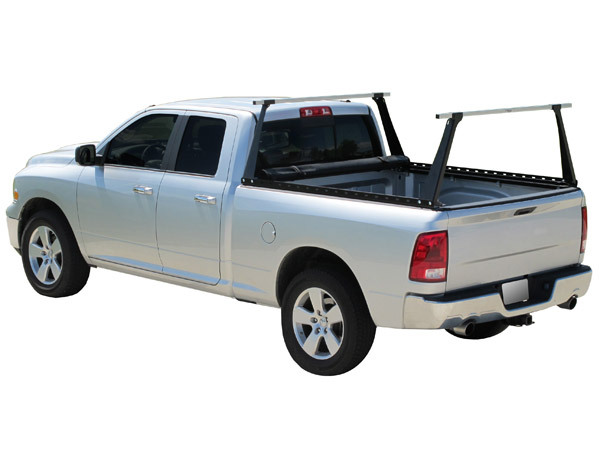 They are simple to install and they open up the truck bed completely as opposed to the hard top covers which tend to offer more limited access. There are different types of roll up tonneau covers: there are the vinyl fabric types and the hinged, hard type that roll up on a spool. On my last truck I had the Lund Genesis seal and peel tonneau. It had velcro side and could roll up like a sheet of heavy-duty vinyl. Lately, I have noticed some trucks that use the folding-type covers that seem more substantial then the roll up type. So I thought I would do a little comparison shopping. My main criteria was a lightweight but tough tonneau that gives easy and full access to my truck bed. I did a search online for both types of truck bed covers and read the descriptions as well as the customer reviews. One thing I noticed is that there seems to be a smaller selection of folding tonneau covers then roll up tonneaus. The roll up covers were made by manufacturers like Extang, Truxedo, and Lund with price ranges from $200 – 400. The folding type truck bed covers were more expensive with price ranges from $500 – 800. One of the brands that caught my attention was BAK, they make the Bakflip folding tonneau cover and it was on the low-end of the price spectrum. It comes in four foldable sections that can be locked in various positions including one that allows you to protect your rear window when you are hauling freight. You can fold it up completely or in sections. After some searching a reading product description, I narrowed it down to the Bakflip folding tonneau cover and the Truxedo Truxport roll up tonneau. Both have cool, innovative features and can be locked for security. In the end , I went with the Bakflip even though it was nearly twice the price. I really wanted a tonneau that was strong enough to stand on and that locked securely. 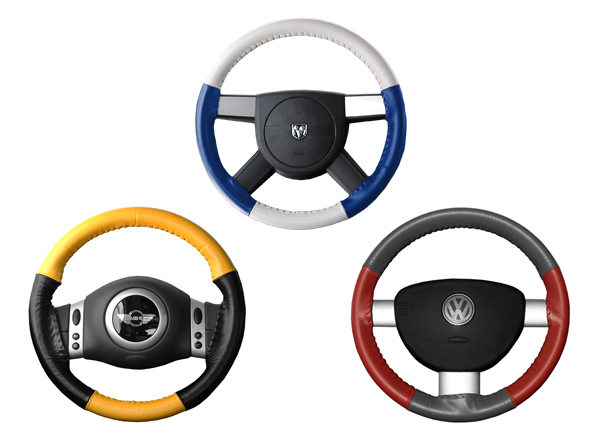 And, I really like the fact that you can open it in sections and even lock it down in different configurations. Very cool. If you are in the market for folding truck bed covers or a roll up truck bed cover, I recommend doing your homework. Pay special attention to customer reviews, they really helped me decide. After the Parisians spit in the eye of Uncle Sam, I hopped right onto the O’Reily bandwagon and stopped spending my hard-earned, over-taxed dollars on French goods. Though most of my chums down at the Elk’s Lodge decided to extend the ban to everything that sounds remotely French, I had to draw the line at tonneau covers. I mean, just because I think Chirac is a grade-A weenie doesn’t mean that I want to put up with poorer gas mileage. So I took a stand and got a tonneau. Here’s my story. In order for everyone to understand where I’m coming from on this issue, I’ll need to delve into the storied history between the US and France. Back in 1914, World War I landed smack dab in the center of Europe, and France bit off a little more than she could chew. Turns out, for all their gusto, those cheese-eating generals couldn’t tell the difference between an Ottoman and a couch. So guess what happened? In came the American cavalry and saved their derrieres. Fast forward to 1939, and another major conflict erupted in the heart of Europe. Basically, it was the same players, same terrain, and same outcome. France got booted out of their own country, and the US had to come over and clean up the mess, again. Why do I bring this up? Simple. We’ve saved that ungrateful country so many times that they have no right to question our international doings. Our Greatest Generation didn’t die face down on the beaches of Normandy 60 years ago for France’s freedom to ignore our every command, no matter how absurd or wimsical. So me and the rest of the boys down at our local Elk’s Lodge decided to take action. We started listening to this political wonk out of Levittown by the name of O’Reilly. According to his logic, the best way to fight back would be with our pocketbooks. He told us to stop buying French imports, and that’s exactly what we did. Wine? Only from California. Cheese? Better be from Wisconsin. 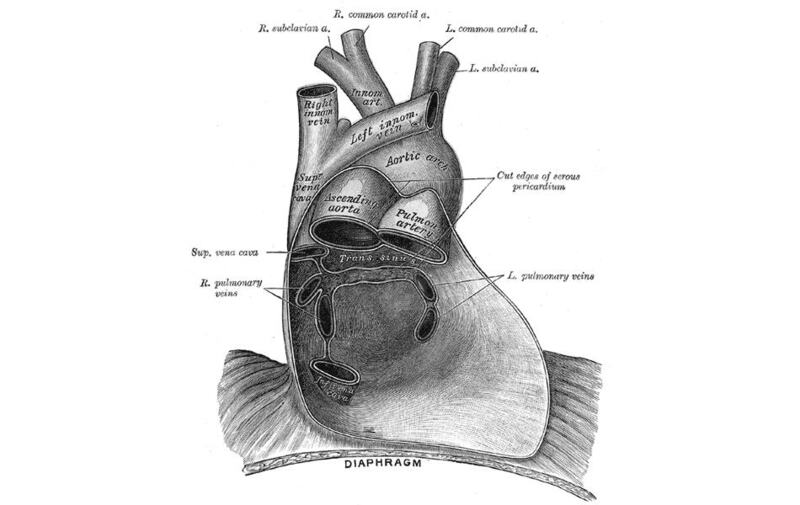 Heartburn medicine? No Nexium for me, thank you very much. Now, to be perfectly honest, it’s been a struggle. I haven’t had a decent flute of Champaign in nearly 2 years. And don’t even get me started on foie gras. I’m about one lackluster round of hors d’oeuvres away from force-feeding my own goose for even a single cracker’s worth of that pate. But I think all our sacrifice is really paying off because old Jacques up in the Elysee Palace is running away from reelection with his tail between his legs. That one goes out to the Gipper. Unfortunately, this major victory is really going to the heads of some of the more power hungry boys in our Lodge. They want to expand the boycott to anything that even sounds remotely French. I can understand nixing baguettes from the grocery list and steering clear of cherries jubilee at restaurants. But I need my hair palmade. And after doing some online research, I learned that I really need a tonneau cover. You see, I have to drive my truck for work, and the cost of gas keeps skyrocketing. I was nosing around on Google to see if I could find something to improve my fuel economy, and that’s when I stumbled across some articles about tonneau covers. 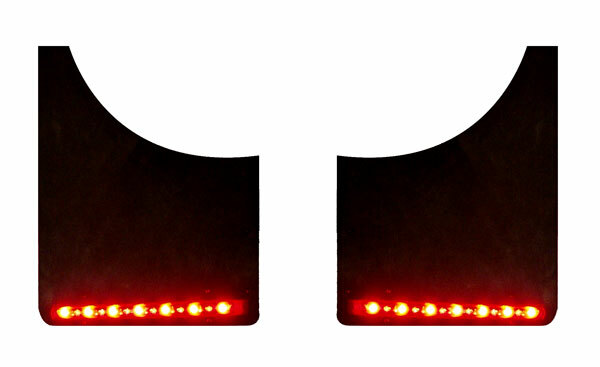 Basically, they cover up your pickup’s box, which stops wind turbulence and cuts your drag. 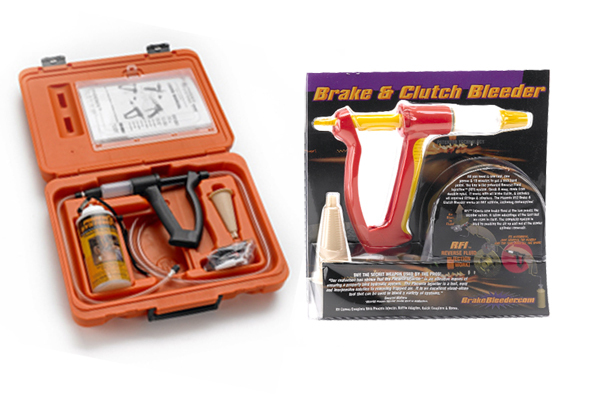 Long story short, you can save some serious dough at the pump with one of these. And there are a ton of companies all competing with each other, so the quality is top notch. I was giving serious consideration to Truxedo and Extang, but I finally went with a Pace Edwards retractable tonneau. I still catch hell down at the Lodge, but I don’t care. The cover was made in the USA, and I’m not going to hold it against the company that these miracle truck accessories sound like they came from Nice. C’est la vie. After researching, the Undercover Tonneau, Extang, and Pace Edwards tonneaus impressed me the most. To fold or to roll, that is the question Whether/’tis nobler in the mind to suffer/The slings and arrows of a shoddy tonneau cover/Or to take arms against a sea of tonneau troubles/And by opposing, end them. To snap, to tear/No more. These days, finding a quality tonneau cover for your rig can be a down-right tragedy. One search on the internet delivers a venerable cornucopia of choices. 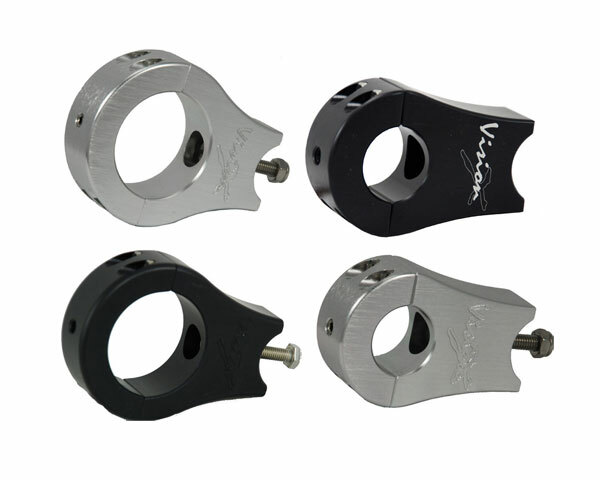 Hard, soft, roll, fold, snap, tri, bi, retract and hinged. There are enough choices to scare off the ghost of King Hamlet himself. The amount of styles one is presented is, of course, only overshadowed by the number of tonneau manufacturers that exist. There has got to be a ton of money to be made by producing tonneau covers because there is no shortage of companies. In the old days, my uncle Claude would take me on a day trip to Tijuana, Mexico to get a tonneau made for his El Camino. We would navigate our way deep into the sticky streets of industrial TJ, looking for the little upholstery shop that my uncle did business with. I don’t know how he knew them or how he found them but he did. The place, Jaliscos, was always abuzz with craftsmen making seat covers and tonneaus while drinking from an endless supply of Tecate beer. After a beer and some broken English bartering, my uncle would take me to lunch in downtown TJ. After we ate, he always bought me cinnamon soaked churro, then he would wink and warn me not to tell my aunt Gertrude. When we got back to Jaliscos, my uncle’s El Camino would be sporting a brand new tonneau cover. Those simple days of Tecate beer, border crossings and chorizo burritos are gone now. Mass production, maquiladoras and homeland security have poured hemlock into the ear of handmade tonneaus from Mexico and left us with a hodge podge of what are now called truck bed covers. On some level it brings a tear to my nostalgic eye on the other hand, I realize that my uncle’s tonneau was really a clunky tarp that actually snapped to his vehicle. And, the snaps were drilled right into the side of his car, permanently! Today, tonneau covers are simply amazing. The higher end gear can be installed in minutes with no drilling or cutting. They come off just as fast and leave no trace of their existence on your rig. Instead of snaps and straps, modern tarps use quality Velcro or roller tracks to stay on. This also means accessing all the stuff in your bed is easier than ever. Some covers fold open, some even have spring loaded latches and gas struts that lift them up for you. And, with the popularity of ecommerce sites, you can have one of these cool tonneau covers delivered right to your front door. To narrow it down a bit and keep the costs within this stratosphere, it’s a good idea to opt for a roll up or folding tonneau. The roll up tarps are usually held fast with Velcro and have spring activated tension adjusters to keep your tarp taught. When you need access, you simply roll the cover like a blanket. It rolls up to your cab where you can strap it open or roll it shut again. 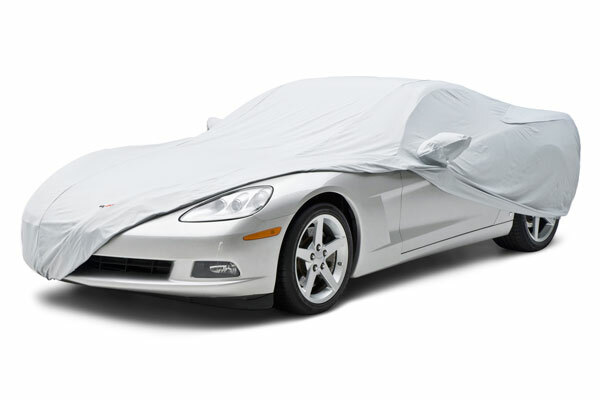 The folding covers are usually comprised of a tarp that is stretched over a lightweight frame. 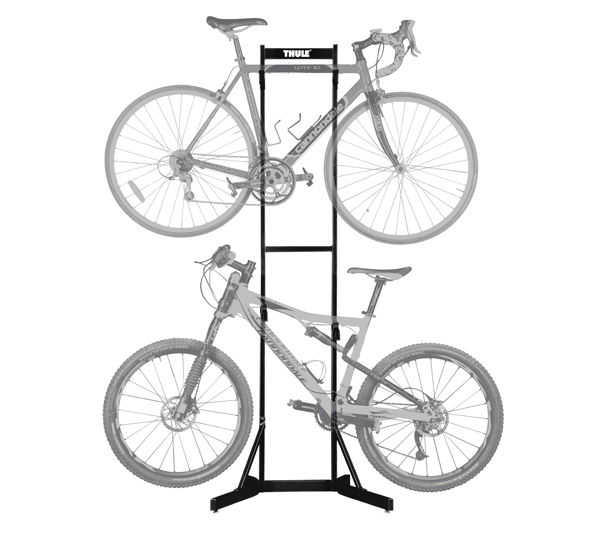 The frame is hinged in sections that allow you to lift it like a hard cover. You can lift sections separately on the nicer covers, giving you access to the different parts of your bed. This is a great choice for those who work in the field and need to access their bed frequently. The end of this debate is no tragedy though. Even though spending a drunken day in Mexico with your uncle is a thing of the past, getting a high quality folding or roll up tonneau cover is something we can all do today. 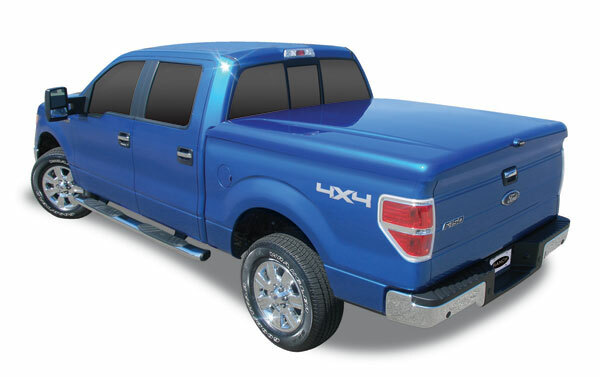 To help wade through the plethora of choices, take a look at Access tonneau covers. Or, my all time favorite, the Extang trifecta tonneau cover is sure to prove most royal. Basically, you can not go wrong with either. Tonneau Covers – What’s with the Frenchy Name? Back in the beginning of our second conflict with Sadaam and the I-raqis, America decided to rid itself of the French. The word French was replaced by Freedom; Bill O’Reilly led a boycott against French goods. So, how is it that these tonneau covers went untouched and un-renamed? Let’s take a closer look. I try to steer clear of anything that sounds too fruity, and anything that even whiffs of the French is definitely too fruity for me. But, when I needed a truck bed cover for my Dodge, the one I bought said “tonneau” on the box. I was furious—the nerd at the local truck accessories shop must have known I would have stormed out before buying a frog product and hid the name from me. Anyways, I immediately went back and asked for a refund. What I got was a quick education in truck bed covers. The guy behind the desk told me that, not only was this “tonneau” not French, it was made by a company called Access right here in America. Apparently, they inherited this wimpy euro name somewhere in the last 15 years, when soft vinyl covers became very popular. A “tonneau”, actually, was the name for the snap cover for the back seat of old cars, like Model Ts and such. So, how did this name overtake something simple like “bed cover” or “truck bed cover?” Well, it had vinyl, and snaps, so some people couldn’t bother to separate them from a product that stopped appearing with regularity sometime after the Gatsbys of the world disappeared. At least that’s what that dork at the shop told me. Me, I think it was a conspiracy, put on by the same censoring suits and hippies who back the liberal media conspiracy. Liberals love to spread French words and that hate-America-first, surrender-now attitude. It wouldn’t surprise me if they were trying to soften the truck-owning heart of America with wimpy language and gas-guzzler taxes like a 1-2 punch. If you have a truck bed cover, you’re still an all-American soldier, fighting for the American way. If you have a tonneau cover, though, you’re a weaker, softer drone just waiting for secular progressives to drag you along on their plans to fatten the wallets of New England elites. It’s a subtle word change, but it means so much more. 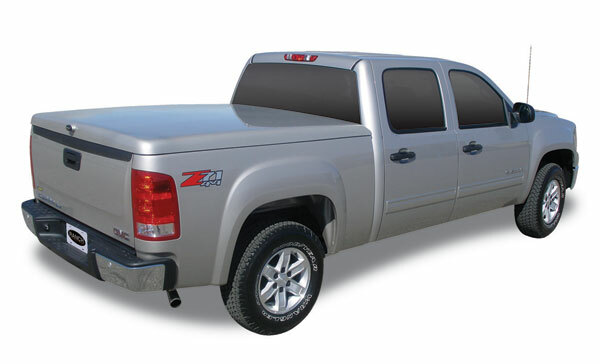 Right here and now, I’m calling for an extension of the French boycott that covers these fruity “tonneau covers.” From now on, they should be known as truck bed covers or freedom covers. If they’re not marked as such on the box, don’t buy it. Let the truck accessories dealers of America know what they’re supporting when they carry tonneau covers. I called the folks at Access and told them about the cause, and they told me they saw things my way, so I ended up buying one of their fine American covers anyway. They assured me that the name would change before I needed one for my next truck. And, they blacked out the word tonneau anywhere it appeared on the box. It’ll do for now. After I bought a truck for me and my family, I decided to spend the next holiday in Florida. But I made one mistake. I thought that the stuff in the truck bed is safe without a truck bed cover. I am 28 and have a great family. Five years ago I married my wife Jasmin in San Diego and just two months later we got our twins Mike and Andrew. Surely it is not all fun and games raising two sons, but I am very proud to have such great guys. They are full of life and always interested in participating in sports like soccer, baseball or just playing a bit with the dog. But what does it mean, if you want to go on vacation with such a big family? Exactly, there is no space in the car to store all your stuff because everyone insists that his toys, games, or books have to be in the car. So last year, we decided to buy a truck to avoid this trouble before going on vacation. It is a Dodge Dakota and I haven’t been regretting this purchase a second. I love this vehicle and the rest of the family, as well. Honestly in the last year we spent more time on vacation than at home just to have opportunities to enjoy the benefits of this nice truck. But before our first trip with the Dodge I made a mistake. I believed that you don’t need a cover for the truck bed; as long as you pay attention, nobody will steel the stuff in your truck bed. When I look back, I know how stupid and naïve it was to think that nothing would happen. I think you can tell by my words that something happened. We were stopped in front of a red light in Florida, when three guys jumped out of their car and stole all the baggage in our truck– all our clothes, all sports stuff and of course my wallet with cash and cards, which I forgot in one of the bags. You cannot imagine how frustrated we were when we recognized that we had no chance to get the money and the other stuff back. Of course we had to turn back home immediately, after we spent two hours at the police station in a small town in Florida, whose name I have already forgotten. After this bad experience with the truck, I instantly decided to buy a truck bed cover for the truck. That is the only way to transfer your stuff safely. And everyone, who disagrees with this, should remember my experience in Florida. So I decided to compare a lot of products and during this market research I recognized that there are a lot of attributes which you should consider before you buy the right truck bed cover. 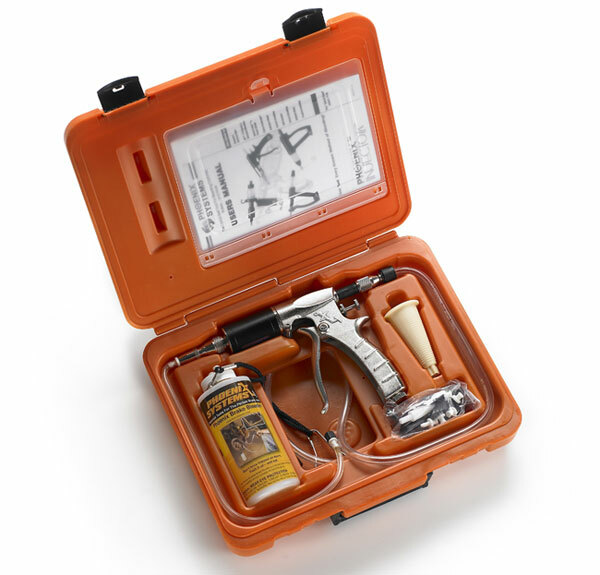 So I found a good one with a tool box that has a continuous hinge and reinforced black power coat lid for superior strength. 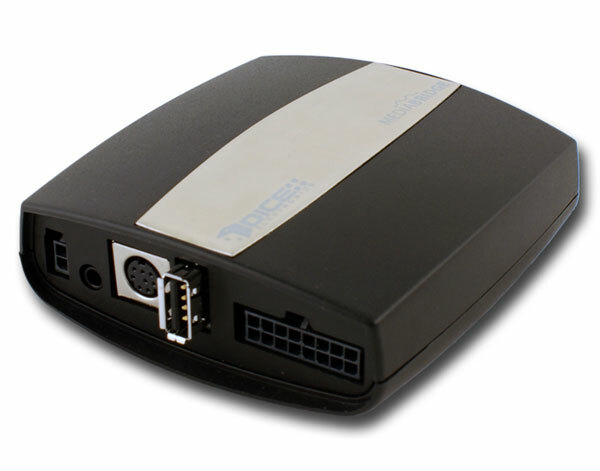 Another factor, you should consider, is that the Toolbox mounts easily to the side rails without damaging truck bed. So listen to my story and spend a bit money and invest in a good truck bed cover. Avarice shouldn’t impact the benefits of great worry-free vacations.